I have never read the Little House on the Prairie series and I finally decided it was high time I did. Quite frankly, I'm very glad that I have waited until now to do so. 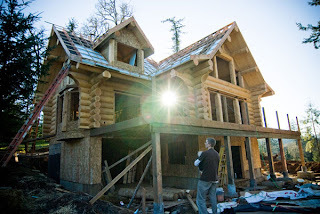 The stories are far more interesting to me, I think, because we are currently in the process of building a log home to live in ourselves. That makes certain aspects of these stories a bit more applicable and meaningful. I was surprised by other interesting tidbits that I ran across as I worked my way through. 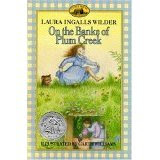 Today I have read as far as On the Banks of Plum Creek. I anticipate finishing this series in the coming week, and I'll post my thoughts on the later half of the books then. Of course all things start in that Little House in the Big Woods. So far this was the least memorable tale for me. Sure, it sets the series up and tells you where they came from and why. Quite frankly, I don't understand Pa and I likely never will. 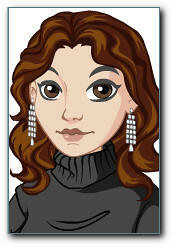 The family was warm and cozy and surrounded by friends and family. Pa felt the need to go adventuring though and that lead them out of the Big Woods eventually. I suppose I should be grateful for people like him who were willing to leave the life of "comfort" that they knew and strike out to explore new territory. Living on the West Coast myself, I am grateful. I just wouldn't have done it, lemme tell ya! 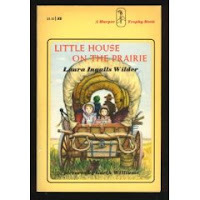 Little House on the Prairie is certainly the most popular title in the series and I have to confess that I do not really know why. I'm frankly surprised that it receives the notoriety that it does in today's society. Why, you ask? Ma's dislike/distrust of the Indians. Now, grant it, Laura is just relating the general feeling of the population of the time towards Indians. They were not understood, their land was being invaded and the white man (in this case, Pa) didn't seem to care. I thought Pa had an interesting perspective of expecting the government to just give him the land that the Indians lived on. I'm not going to state my opinion about this one way or another. History is history in this case. I'm just a wee bit surprised that this book is promoted so heavily. Sure, it does explain life on the Prairie. Laura relates the story of the night when Almanzo's father sold two of his horses for two hundred dollars. Unable to make it to the bank, they had to keep the money in the house, which worried Almanzo's mother something awful. Although she was anti-dog, it "just so happened" that a stray dog appeared on their doorstep and was befriended by the children that same night that the money was in the house. Buglars had attempted to come and steal the money but were chased away by this stray dog. The next morning the dog was gone but footprints were found on the property. A God-thing? I think so. See, even if you don't recognize that God is active in this world and even in your life -- it is a truth. He protects His people for a reason and a purpose -- whether they choose to acknowledge it or not. How many times in my life have I not been aware of His care for me? I'm thankful for it nevertheless. It's stories like the stray dog that drive the point home sometimes. Lastly (for this week) is On the Banks of Plum Creek. This book made me like Pa even less. I know he had good excuses for having to leave the family to go find work. I guess I'm just disappointed that up to this point he's been incredibly resourceful and unwilling to be "beholden" to anyone. In this book he's banking on wheat that hasn't been grown and throws his family into debt which results in him having to leave them for months at a time to go find work elsewhere. It's just a sad situation, really. If I were Ma, I'd be a bit put out with him. Especially when he failed to heed her advice about going to town when a blizzard could have been on its way (which it was) and resulted him stumbling about in the snow until he found shelter. Pa always has a good outlook on life -- but I think he would have been an EXASPERATING person to know! I like steady and I think Ma did too. Pa doesn't strike me as steady enough. But then, that's probably why the west was settled. It's those crazy adventure people who are able to smile against the odds that frequently make things happen. The last thing I'd note about this book, and the second most memorable thing, is the grasshoppers. Can anyway say "EWWW" louder than myself? The swarm of grasshoppers was just downright disgusting. There's no getting around it. It's hard to believe that would happen outside of the plagues of Egypt when locusts swarmed the earth but....I cannot image living through something like that. I really am enjoying this series and am anxiously ready to hop off onto the next book. So here endeth Part I of this review. Its very interesting to hear someone's reaction to their first time reading the series... I first read them when I was in kindergarden, and have reread the entire series AT LEAST once a year (more often for my favorites)every year since (I'm 26). What a wonderful review! It is so interesting to read your first impressions of the books. Like aria, I was in kindergarten when I first read the series. Then I re-read them later (around grade six, I think) but I haven't re-read them since and I really want to get to them this year. Pa is definitely a character. Actually DOB is rather like that but fortunately for me his bad foot keeps things somewhat under control. :-P Right now he's decided to go for a new three-year high-level certification, but it doesn't involve moving so it's fine with me! I have an uncle who is almost exactly like Pa, except he's an inventor and businessman. He's in his late 70s and still in constant litigation and business deals. And my aunt has stuck with him from living in refurbished chicken houses to million-dollar deals and moving all over the west. Guys like that are exasperating at times, but they're so cute when they're excited about something new. So although Ma must have had her patience tried many times, I think on the whole she liked having him around. And every once in awhile some of them strike it rich. For awhile, anyway . . . I think the ducklings will be ready to hear at least the first few books by next fall. I can't wait! I so enjoy your blog. Thank you for writing it. 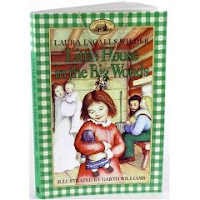 I also first read the Little House books as an adult. 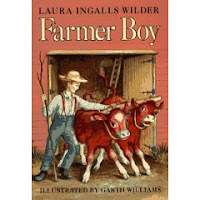 My children and I were always so hungry after reading Farmer Boy. I later read that when Laura wrote it she wanted to tranlate the wealth that Almonzo had that she didn't and she did it with food. Almonzo is always eating and then he stuffs a piece of apple pie in his pocket on his way out the door. Laura wrote these books when she lived in Mansfield, MO. The museum and house are a delight to see. Mary's nine patch quilt and Pa's fiddle are there. Rose Wilder Lane was the oldest war correspondent to Vietnam and one day she said to her mama, you should write a book. I'm sure glad she did.